Someone the other day asked me where I really want to go. What places I have to see at some point. The question got me thinking and after a little contemplating I think I’ve come up with a shortlist. It wasn’t easy, because there are so many places in the world I would like to see, but here are the 10 places that definitely makes it onto my bucket list. Vietnam has been on my radar for the past few years, but jumped up on the bucket list quite recently because I was browsing Contiki and read up on their Vietnam Experience. The trip has since then been in my head and I hope to go sooner rather than later! Macchu Picchu is a UNESCO World Heritage Site as well as one of the Seven New Wonders Of The World. I hope to walk the Macchu Picchu trek one day and take in the view, the ancient grounds and the long lost culture. I also want to visit the village of Cuzco and see Peru in general. Latin American and Native American cultures fascinate me. Now this one just calls to the inner fantasy nerd in me. New Zealand looks beautiful and good for an adventure, but mostly I want to go to learn how to dive and to see Hobbiton. I am a massive Lord Of the Rings and Tolkien fan and walking around in his world made tangible would be a dream come true. Another of the Seven New Wonders Of The World and a UNESCO World Heritage Site is the Great Wall of China. Though a lot of the wall has disappeared over the years there are still man many miles left that are open to explore. This architectural and cultural giant is definitely on my to-see, or in this case, to-walk list! Chichen Itza is an old Mayan city, possible the oldest, and in it there are plenty of Mayan temples, pyramids and history. I would love to visit them and take in some Mayan history which in my opinion, together with the Incas and the Aztecs, have some of the most interesting histories in the world. Chichen Itza is one of the Seven New Wonders Of The World. The Forbidden City, Beijing, China. Another bucket list place is the Forbidden City in Beijing. The Forbidden City was an imperial palace during the Ming Dynasty and now houses the palace museums, with countless artifacts from different emperors. Dubrovnik is the now famous location of King’s Landing in Game of Thrones, but it is also a UNESCO World Heritage Site full of history and gorgeous architecture. I have to admit that Dubrovnik first showed up on my radar because of GoT, but after some research I think I’d love to visit it just because it looks so beautiful! Egypt is one of the countries I really really want to visit in general and while I am there I would have to see the Pyramids of Giza and go on a tour or two to learn more about Egyptian history and culture. A river cruise on the Nile doesn’t sound too bad either 😉 The Pyramids of Giza are the oldest of the Seven New Wonders Of The World. Another African country that I want to visit is Morocco and when I started to think about where I wanted to go Marrakech came to mind. In my post about my holiday in Tunisia I mentioned visiting the Berber town and loving it and Marrakech is a major city built on Berber traditions. 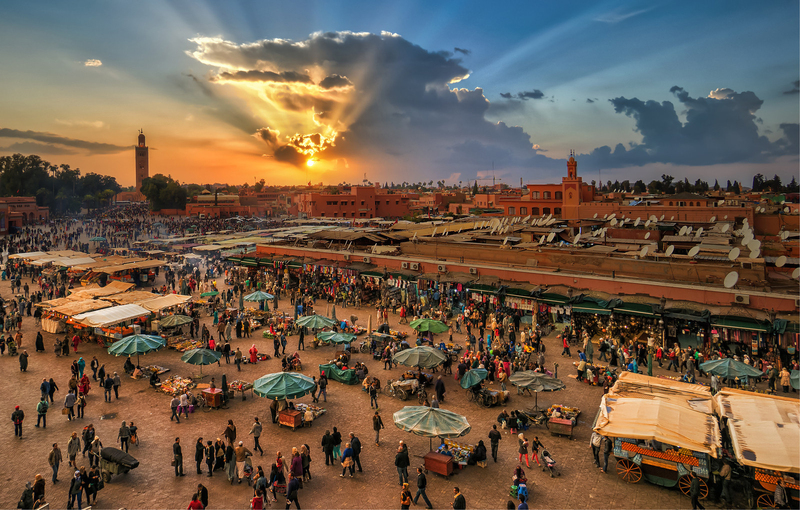 I can’t wait to walk through the Medina (town market), smelling the spices, taking in the colours and getting aquatinted with yet another culture. Iconic New York also made it onto the list, mostly because it is one of the American cities I would like to visit the most. It doesn’t rank high up on the list, but it does make it because I would love to visit America. The fact that New York is full of tourist attractions also helps.